A fox terrier will pick at a hot spot until it gets infected. Hot spots are wet, soft sores or light scabs that can develop on fox terriers when they chew or bite repeatedly on a skin irritation. Fox terriers are tenacious little dogs that can become obsessed with biting and licking, which makes hot spot identification and treatment especially important. A lot of different things can trigger the start of a hot spot. A yeast infection, bug bite, fungal infection, dry skin, eczema or a scratch or wound can all get your fox terrier started with obsessive licking. This breed is also subject to a condition called atopic dermatitis -- an inherited skin allergy related to pollen and dust mite exposure, and even some food allergens. Once the skin is irritated, the fox terrier will chew and lick at it until a moist, open wound appears. It gets the name “hot spot” because the area is often warm to the touch. Your vet should diagnose a skin irritation as a hot spot and recommend a specific course of treatment. Self-diagnosis and treatment could lead to an untreated infection, or worse, overlooking a substantially more dangerous medical condition. If your fox terrier is prone to hot spots, your vet may help you understand how to identify and treat subsequent occurrences on your own. Most hot spots are treated by trimming the hair around the affected area, cleaning the wound and drying it. Your vet likely will prescribe a topical ointment designed to reduce the potential for infection, to stop itching and to speed healing. If an infection is underway, oral antibiotics may be prescribed as well. Given the nature of your fox terrier, your vet also may recommend a plastic cone to keep your pup from continuing to lick at the wound while it heals. 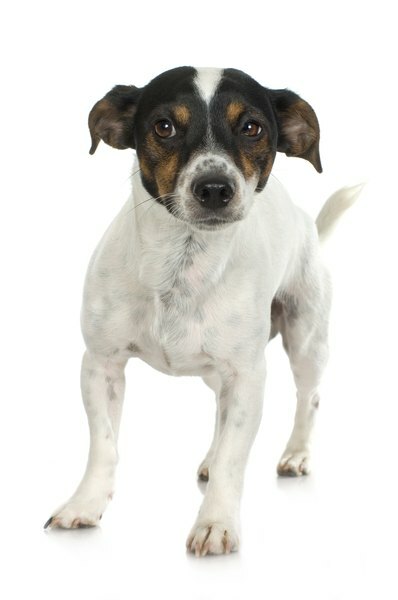 Use a flea and tick repellent product on your fox terrier to protect him against insect bites. Fox terriers are known diggers, so keep an eye on where he digs. For example, if he digs around your garden or flower beds, he might be exposing himself to insecticides or pesticides that cause the initial skin irritation. Regularly groom your pup, especially if he has wiry hair. This will keep his coat in good shape and help you identify potential hot spots before they get out of control. Pet MD: Hot Spots on Dogs! Just What Are These, Anyway? Can Yorkshire Terriers Eat Raw Green Beans? Can a Full Blooded Black Lab Have Black Spots on His Tongue? Are Fox Terriers Good With Cats?